I had to skip the WOD on Thursday because of a splitting migraine. So it was a bit of a slow week for me. But the beach WOD yesterday was a lot of fun. Much more fun than last week. I had trouble getting up for it again though. Luckily it was the last time that I will have to get up so early on a Saturday morning to be able to go. Because yesterday I moved apartments and I now live very close to the beach where the WOD is. And also to the box. Once my bikes are fixed I will be able to bike there!! 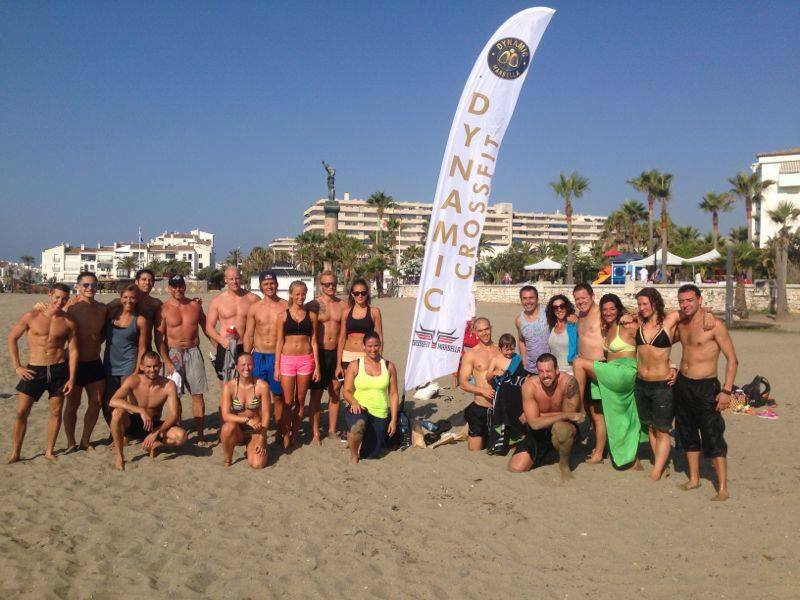 Much better :D.
For the beach WOD we got divided into two teams again. This time everyone had to take a plate (mine was 10lbs) and had to walk a course with it. It started with throwing the plate from the chest, as far as possible. Because you had to cross a certain distance while doing this. And every time you threw it, where it landed, at that place you had to do 7 push ups and 7 squats. So the further you could throw it, the less exercises you had to do. When you reached the end point you had to take the weight and lift it above your head and walk/run to the next station. At that station it was time for 25 burpees and 25 sit ups. After those were done you had to take the plate up above the head again and walk into the sea until the water was waste up. Then from one point in the water walk to another point and then back on shore and walk/run back to begin point. All with the plate above the head. That was one round and we had to do three. You could only start with the second round if everyone in the team finished the first. Had to wait in plank (or run laps) while waiting. I was one of the last ones to finish each time so I didn´t have to do any planking :p.
I think I´m going to try and add an extra CrossFit day to the week… since I live so close now it´s easier for me to as it will take up less time. And I feel that I want to do more. So I think starting tomorrow I will go on Monday, Tuesday, Thursday and Saturday. Maybe I won´t start this week though, but next week. Because Murphy still has to get used to the new house, so maybe not such a good idea to leave him alone too much this first week. For the first time I really didn´t feel like going. It takes a lot of will power to get up at 7am on a Saturday morning to drive half an hour to a work out :p. But I was happy I went anyway. It was a short workout compared to the one we had last week on the beach. This time we got divided into two groups (of twelve) and there were 5 stations placed around the beach (with a little bit of running distance between them). Everyone in the group had to do all exercises on all stations, but you weren´t allowed to continue to the next station until everyone in the group was finished. If you were fast you had to wait in a plank position until all members of the group were done with the exercise. That was one round. And we had to do two. The hand stand push ups were surprisingly easy, mostly because my partner pretty much just pulled me up haha. I absolutely hated the bear walks. They were awful. Almost as bad as the frog jumps. Before we started it was set to do 20 of them. But after doing 1 bear walk I think the coaches realized it would be too much so luckily they changed it to 10. The rest of the exercises were quite easy. It´s just hard to do so many of them, in the sand. I felt a little bad after this WOD though. Because our team was faster than the other team so we “won”. But I cheated a little bit. On the bear walks I didn´t do ten when we moved onto the next round. I gave into peer pressure. I was a bit behind when everyone was already in plank waiting for me. And they wrongly assumed it was my last walk, even though I was only on my 8th, but I was too self conscious to correct them. Afterwards I felt really bad and I definitely won´t be cheating from now on anymore! They will just have to wait for me. Or help me out, because that was also allowed, if one team member struggles keeping up, another team member can help out by doing more (so I could have done 8 and someone else 12 for example). I think of all WOD´s up till now this was my least favourite. But that´s mostly because I felt like a big cheater afterwards. It was so nice to work out at the beach. So different from a work out in a sweaty box, haha. There were a lot of people too! I think we were with at least 20. The exercises were all team exercises. We got divided into groups of 4 (2 boys, 2 girls) and the goal was to complete each station with your group. I think all the distances for doing things were about 20m (10 one way and then back). So one time back and forth counted as 1 rep. And you had to do 10 reps with the total team so not 10 each. And you also didn’t have to divide it equally. So for the carrying another member part I didn’t have to carry my very tall and muscly partner, he just carried me 5 times, haha. Before we got to start on those we first had to run on the soft sand to warm up. After that everyone had to run across the shore to a certain spot, from there jump in the water and swim up to a cone and back and then run back and start with the above stations. I think all in all it took us about 50 minutes to complete everything. And afterwards it was so nice to just jump into the sea again to cool down! It was hard though.. our group started with the frog leaps, which were horrible right from the start. And doing everything in soft sand doesn’t really make it easier. Then we did the dumbbel stuff, which was the easiest of all of them I think. The ‘run while carry a team member’ wasn’t so hard for me either, because I was the one getting carried all the time. But the next station… the human wheel barrel. That was so hard!! Beside the fact that i was just very heavy to do it was also very painful for the wrists. Not nice!! I was glad when these were over. Our last station were the overhead lunches. I kind of like lunches, but as it was our last station and we were already really tired it was quite a struggle to get through them. I do feel a bit worn out now. I had a very little sleep last night. I was sleeping at my sisters place and it was soooo hot and noisy in her guestroom. I just could not relax. In the end I moved down to the livingroom and slept on the couch. Not ideal.. But I took a nap after the workout this morning and just had some food and can already feel my energy getting back up. Which is a good thing, because I’m going Stand Up Paddling this afternoon! But ya, loved this beach WOD. Will definitely be going every Saturday! !